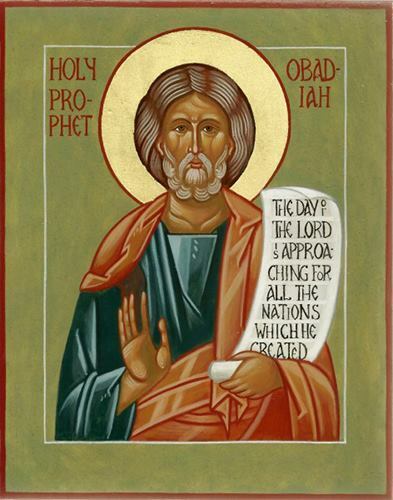 We know nothing certain about the life of the Prophet Obadiah. The Synaxarion identifies him with the servant of King Ahaz, who left to become a follower of Elijah, but that is not possible, since Obadiah’s prophecy was against Edom, pointing to a time after the exile. He is one of several prophets commemorated in the Phillip’s Fast, and verse 21 can be related to the coming of Jesus into the world: “And deliverers will ascend Mount Zion to rule Mount Esau, and the kingship shall be the Lord’s” (Obadiah 21). When our Lord was born, he was given the name “Jesus,” our Savior or “Deliverer.” The Greek text, however, is “men saved.” Certainly the wicked Herod thought him a king to rival him, and so persecuted the innocents of Bethlehem. Obadiah tells us that the Lord alone is our true king, who told Pilate at his trial, ““My kingdom does not belong to this world. If my kingdom did belong to this world, my attendants would be fighting to keep me from being handed over to the Jews. But as it is, my kingdom is not here” (John 18:36).